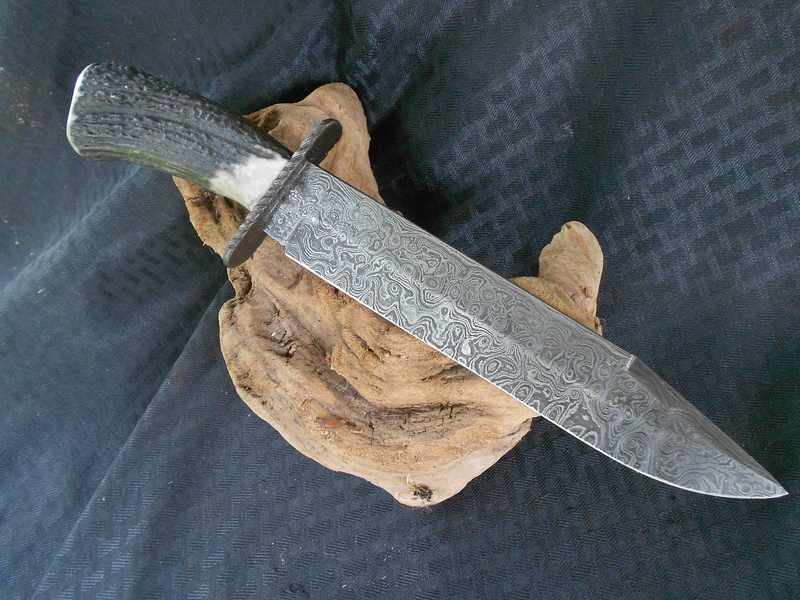 Bowie with a Deep Etch - The Iron Forge Fire Blackmithing Forum. Got a new computer and haven't been able to post in a while. Been busy. Here's a little play time. 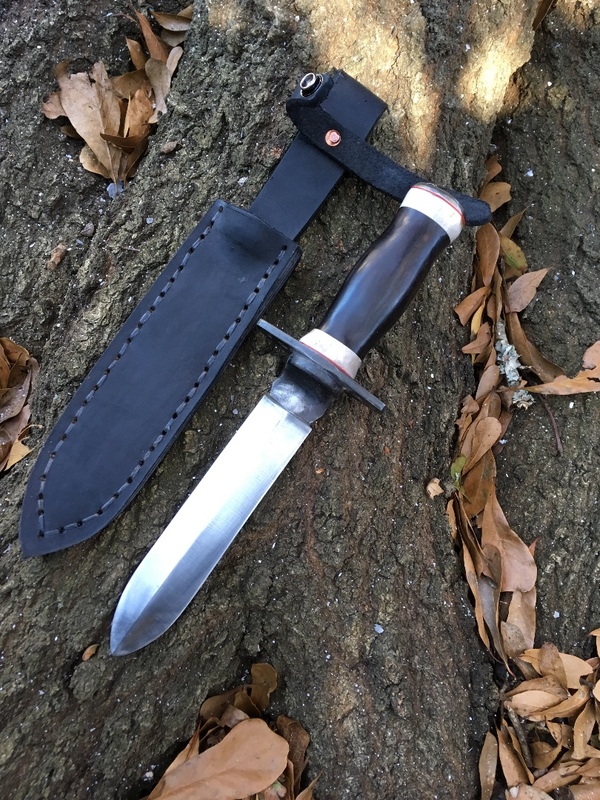 This Bowie was forged from L-6 and 1095, folded to around 160 layers. The pattern was manipulated by drilling divots and grinding notches. It was given a very long etch (not totally on purpose, took my wife to lunch lol). Normally I don't use a cable guard on a non cable blade but it seemed this one needed it. 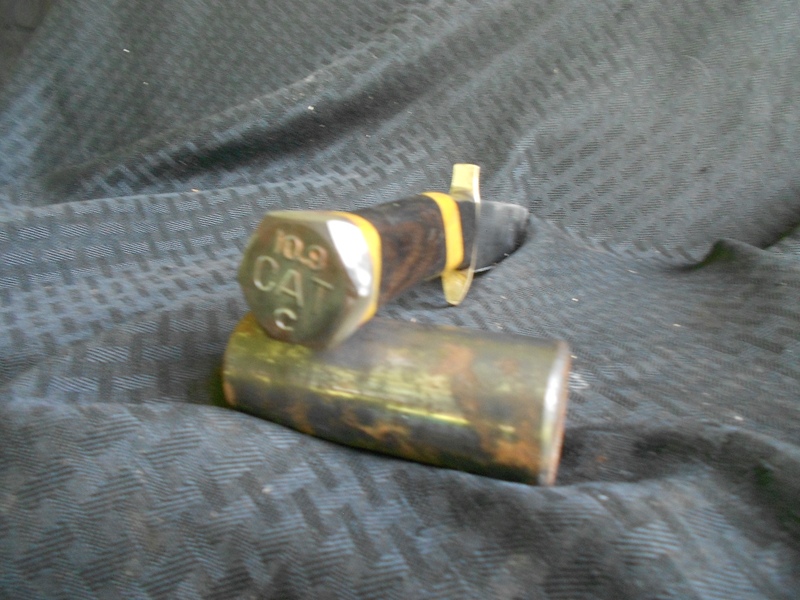 The handle is elk antler with a brass pommel. Very nice. I also love the tight fit between the blade and the guard. I have a challenge with that. Files and taking ones time. 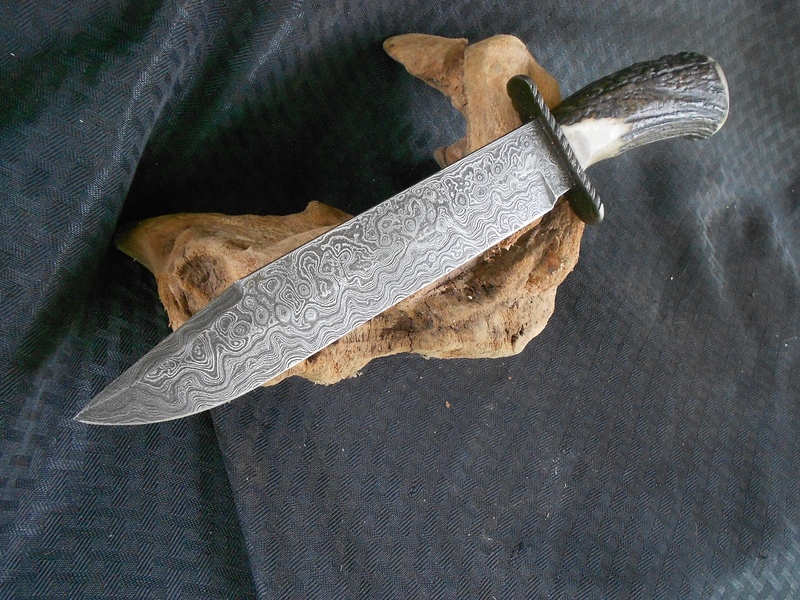 Hello JMC, This has a wonderful pattern in the blade. Different style. Have you experimented with anything new? I would say you nailed it. Love the handle and the color variation. Creates a balanced look. Is this for a customer? Wasn't made for anyone in particular. Was just experimenting. Sometimes when the forge is hot I'll do that. Here's a wild experiment. A guy wanted me to use a CAT bolt in making a edc. Well, the bolt wasn't good enough steel. So I ran with the idea and used a roller bearing from a CAT front end loader. 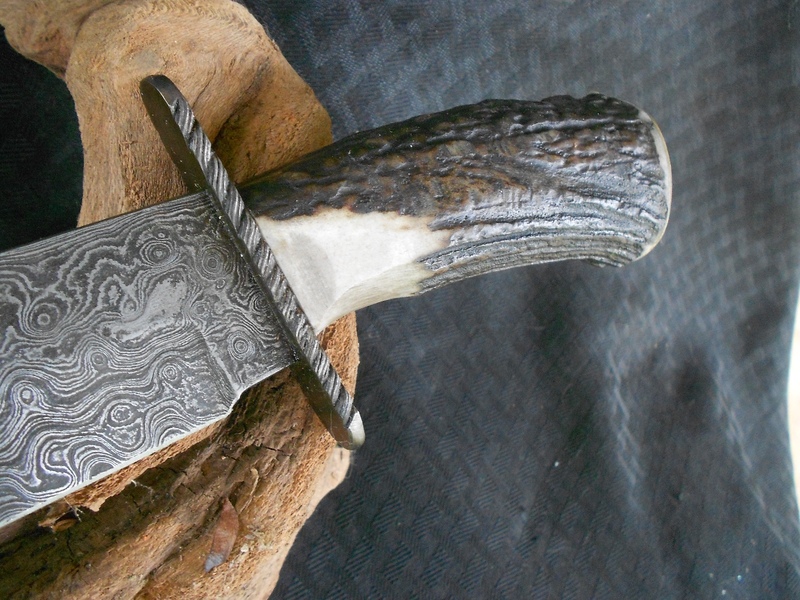 I'm not real happy with the flow on this one, but I'm going to shoot a video on the forging of a larger blade that should give a better flow through the handle into the bolt/pommel. Jim's work is very nice. 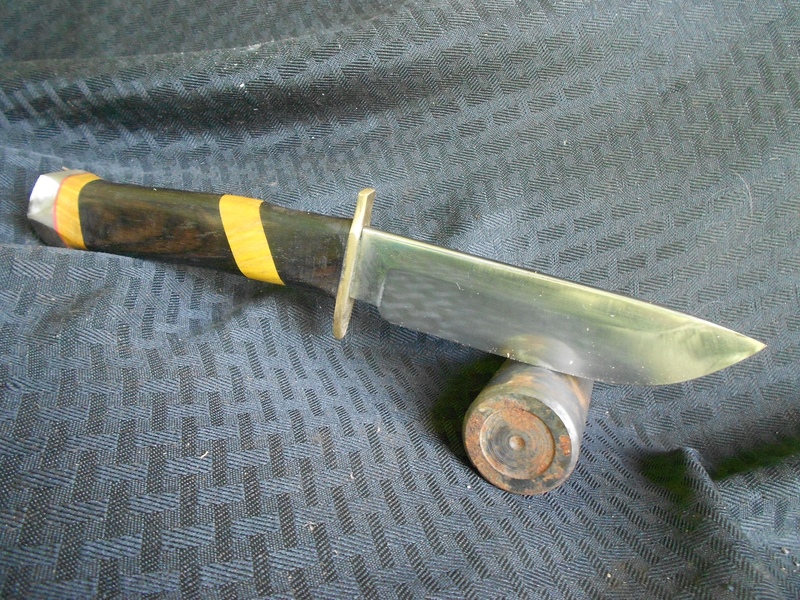 My Knife, which was finished by Jim and he made it a knife, has received ssssoooo many comments from my friends it is crazy. One of my friends has started putting a small shop together because of it. If I may... post it again, here is Jim's finishing work... I will leave any finer points to Jim, other than it was formed into a rough forging by a 2500 pound Large Board Drop Hammer with me at the Tongs a long time ago. Thank you Jim ! Hey Jim was just thinking... Have you applied to the Forge In Fire Show ? Your work is nice, to me better than a lot of the other Blacksmiths on the program. Thinking you might just win it. Really, they have a demographics they want to cover. I happen to be in the most populous demographic. It doesn't help that I'm ugly as homemade soap. If they were to offer a spot now I'd probably turn it down. Things have gotten a little out of hand. It doesn't make sense how they choose their candidates for the show. Some appear to have a hard time performing the steps needed to produce whatever it is they want for that show. As far as Ugly, aren't we all ! The show took a turn, not sure exactly when, but the skill level dropped and some of the first round presentations are a little less finished as one might expect; even I as a Novice can notice the difference. Tell them you have a heart condition that can cause some drama if you get too hot for the processes and they will put you on. When I started watching the program I thought it would show me more of the actual steps in the process of Blade Making, not that I would even attempt it but I would like to watch. Anyway, IMHO, you wouldn't have a problem winning... $10K, would be NICE ! Nothing makes sense these days ! As always great work JMC. I still have the 2 knives I got from you and they are definitely my top prized blades.